Hey, that dress looks familiar! Alison Gary of Wardrobe Oxygen is one of our favorite fashion bloggers for many reasons: she's able to deftly balance her personal style with the more buttoned-up dress code of her corporate job in Washington, DC; she gives great fashion advice; and whether she's talking about trends, music, or a sweet moment with her 5-year-old daughter, she always comes across as smart, funny, and refreshingly real. We asked Allie for her thoughts on appropriate office attire, favorite outfits, and the future of fashion. Anyone who follows your blog and Instagram feed knows you work in a corporate environment, but your off-hours wardrobe is decidedly more laid back and bohemian. How do you reconcile your personal fashion sense with your office dress code? Luckily my office is pretty open-minded with what they consider appropriate business attire, so I can get away with more boho of pieces the days I don’t have in-person meetings or conferences. However, I always shop first for the job as it’s the reason I can afford my weekend wear. I gravitate towards solids which can better dress up and down, and jackets which can look weekend cool with a band tee and boyfriend jeans or appropriate for the office with a blouse and trousers. Do you have any tips for other women who'd like to infuse a bit of their own style into their work outfits while still looking professional? The best way is with color. I notice many women stick to dark shades and neutrals in the workplace, but studies have shown people react positively to color. So why not switch it up and wear a blouse in candy pink or a dress in teal green? It’s also a great way to give new life to office wardrobe staples. When done in moderation, accessories can really infuse personal style, but it’s important to remember you’re at an office, not on a runway. Keep the really flashy, jangly, and trendy pieces for the weekend. How do you define professionalism, in terms of dress and personal presentation? Respect, be it for the company you work for, the clients who employ you, the staff who you manage, and those who manage and mentor you. We don’t wear white to a wedding out of respect to the bride, we don’t wear a tube top to a place of worship out of respect, a professional shows respect for the job she has by dressing appropriately, for her position and not her self. 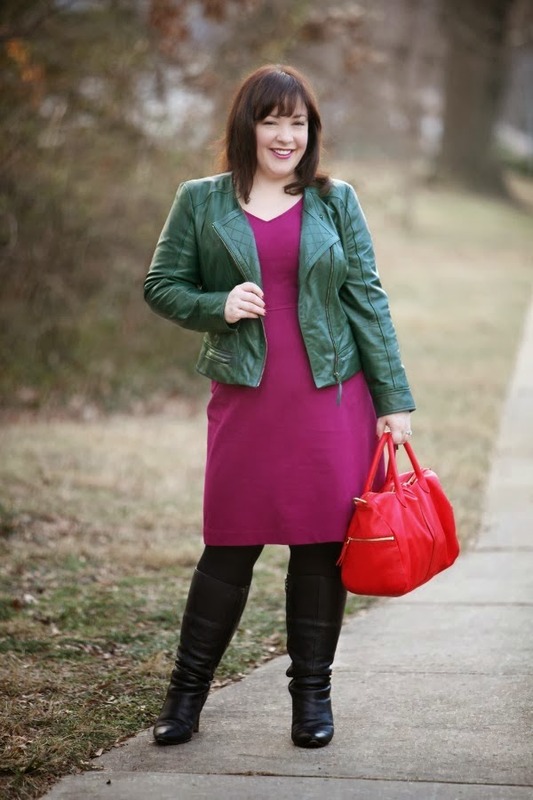 We love the way she styled our Simone dress! Tell us about your favorite outfit. It’s very simple, a navy and white striped boatneck from J. Crew Factory, NYDJ’s “Hayden” jeans in a dark rinse, and black riding boots in cold weather and Converse Shorelines in white in the warmer months. My favorite accessory is a sterling silver cuff I bought for myself in 1997 after my first post-college job interview; I got the job and consider the cuff a lucky charm! What's the most common style mistake you see women making these days? Any style mistakes from your own past that still make you cringe? I think a common fashion mistake I regularly see is being too matchy-matchy. Red lipstick, red belt, red shoes, red bag, red headband, red nails. Being too color coordinated cheapens a look. I know it can be scary to mix neutrals; a great way to start is with animal print accessories; a leopard haircalf belt or cheetah print pair of pumps can be a neutral and breaks up the monotony. A colorful belt in patent leather can work with regular leather or suede shoes without looking too disjointed. Chanel is famous for encouraging women to take off one accessory before leaving the house, I encourage women to switch out one matchy matchy accessory for something unexpected! As for me, I recall a time when I had a pink oversized silk shirt that I wore with shimmery pink shadow, pink lipgloss, and those tiny claw clips (also pink) that held my hair back like a headband. That was a popular combination for me in the late ‘90s! When it comes to your wardrobe, how do you decide what pieces to invest in and which ones to save on? I learn from history. It’s easy to assume that “staples” should be what you invest in, but often the unexpected accents to a wardrobe get the most wear and last the longest in your closet and heart. For me, I find shift and sheath dresses to be a piece I’ll wear season after season and year after year so I don’t feel so bad spending a bit more to have it fit well and last. I also don’t hesitate to spend money on boots; I wear boots almost all fall and winter and find that when I purchase quality, they last longer and usually have a more timeless silhouette. However, for another their investment item may be blazers or handbags, or penny loafers. When it comes to investment pieces, you know better than any style expert or book as to what will provide the best return on investment. 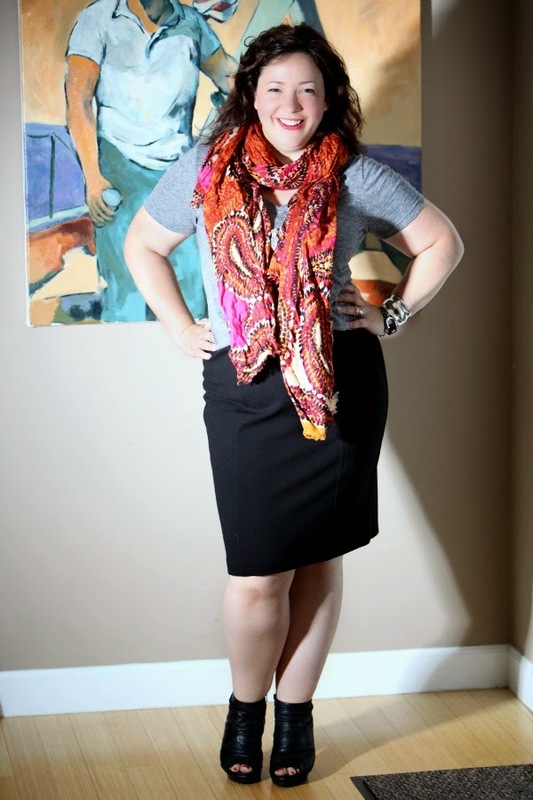 Rocking one of our classic pencil skirts. After many years of fast fashion dominance, there seems to (finally!) be a renewed interest in quality, with a specific focus on American-made clothing. Any thoughts on this shift, either in regards to your own shopping choices, or the future of fashion in general? I’m thrilled to see it. We’ve had our heads in the sand for too long but tragedies such as the one in Bangladesh have forced us to be aware of where our clothing comes from and how it is made. I’m trying to feature more American-made independent brands on Wardrobe Oxygen to show you can find quality, style, and fun trends made ethically right in our backyard and there’s been a big change in the brands that take up the most real estate in my closet. Who are your personal style icons? Where do you get your fashion inspiration? Diane von Furstenberg, she is such an inspiration. I love her personal style, her attitude, her clothing line, her everything. I found a copy of the 1977 Diane von Furstenberg’s Book of Beauty at a thrift store and 90% of that book is still relevant today and a great tool on how to live a quality life. Pardon my French, but DVF is a badass! Leather accessories add an edge to our Eva dress. Classic boho rocker? Hard question, I have multiple personalities in my closet, but all seem to be inspired by music! OK, we have to ask: what's your favorite Dobbin garment? And why do you love Dobbin? 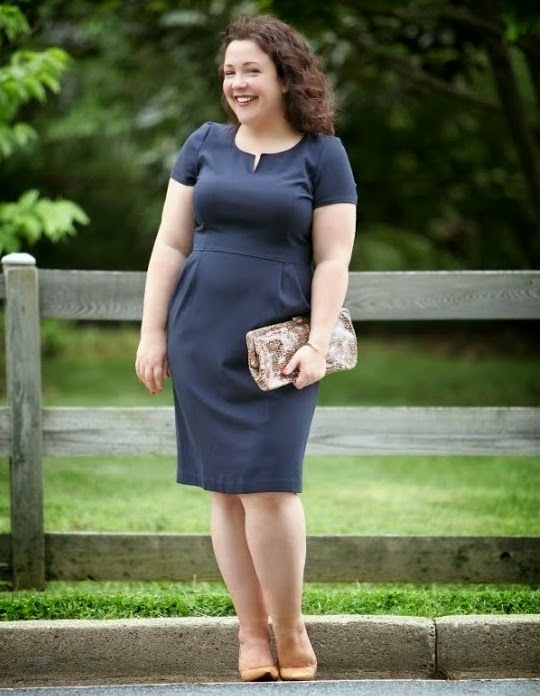 My favorite Dobbin garment has to be the Jackie Stretch Ponte Dress; I have it in navy and it’s the perfect dress for most anything! I dress it up with pearls and heels, wear it to work with pumps, worn under a blazer, and even worn on the weekend with flats and a cardigan while running errands. I love Dobbin because I know it’s quality, it’s stylish without becoming dated, it fits my curvy frame, and it’s made in America. But the biggest reason I love Dobbin is because it’s a company run with heart. I’ve seen how Jess and Catherine care about their customers, how well they interact on social media, and how much they want to provide a great line of clothing. Be sure to bookmark Wardrobe Oxygen for more insight and inspiration. Jumped over here from a link from Wardrobe Oxygen. What a nice line of clothing. 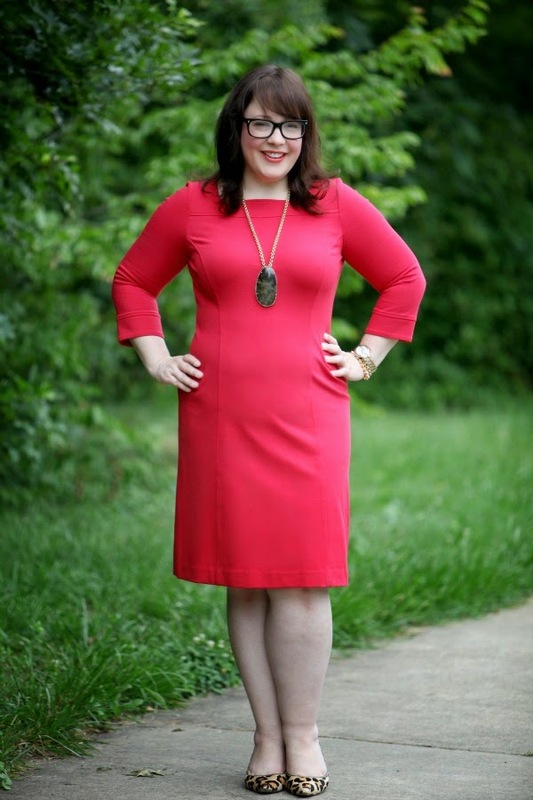 Unfortunately, I'm just a smidge too large for it, but I love the classic tailored lines. Made in America is always a plus for me too!